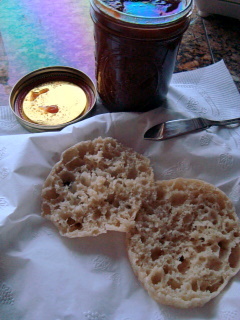 I love English muffins, not only for breakfast but as a sometime lunch mate (ok, so I like tuna melts). But they pose a quandary for me: my usual recipe is easy to work with and handle, but produces muffins with a rather tight crumb. 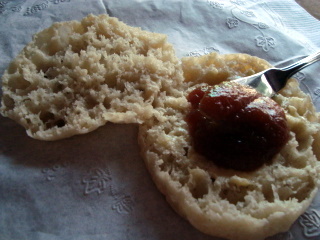 And let's face it, English muffins are all about nooks and crannies, so this won't do. 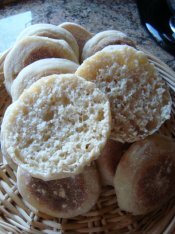 There are, of course, lots of recipes for English muffins that are based on dough with a batter consistency that produces wonderful open crumb. But these necessitate using either muffin rings or accumulated empty tins of canned tuna. Frankly, my kitchen already has too much stuff and I'm not about to begin assigning a shelf to empty StarKist cans. Plus, I want a formula that can be used in a bakery where production might involve a hundred or more on a daily basis. For that, EM rings (or empty tuna cans) aren't the answer. One of the nice things about this particular recipe is that the levain constitutes over 30% of the dough weight, so it brings a tremendous amount of flavor to the muffins. This will produce six, 3.5 oz/99 g English muffins, and a smidge of leftover dough. Add levain to water, then add dry ingredients and mix on speed 1 for approximately 3 - 4 minutes. Mix an additional 3 - 4 minutes on speed 2 until moderate gluten development. (With my fairly weak Hamilton Beach I'll sometimes go to speed 3 for a minute if the dough insists on climbing up the dough hook). Place dough in a lightly oiled bowl, cover and allow to ferment for 1 ½ hours. On a well-floured surface, divide dough into 3.5oz/99 g pieces. I roll these by turning the floured side up, and using the stickiness of the non-floured dough which is now side-down to let me create apricot-sized pieces. I'm pleased with the openness of the crumb that this recipe achieves - and without the hassle (to me at least) of having to use molds to keep the muffin shape. And now, on a very warm Washington, DC evening, salade niçoise à la English muffin. Have to try this one..
Wally, Those look great. 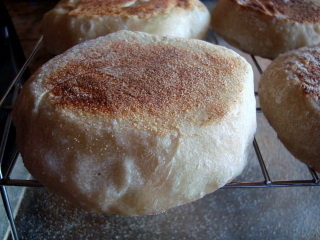 I love english muffins and have yet to find one as good as the "nook and crannies" brand. They just don't have the same flavor or are lacking the open crumb. Saving your recipe for the weekend. Your salad Nicoise looks like the perfect meal for a warm summer evening! Give this a try and let me know your thoughts. I see folks here always looking for the 'ultimate' English muffin, and while I don't for a minute think this is it, it seems to fill the bill for me. I haven't attepted your recipe just yet. However, I'm a it confused about the levain. 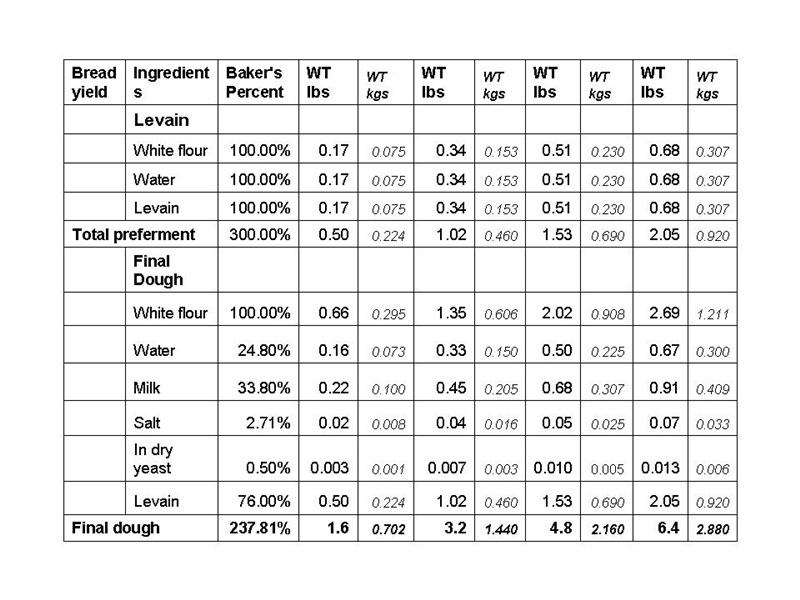 How much instant yeast is used to produce the Levain? What would be the percentages of the ingredients if I wanted to double or even tripple the recipe? Wally, we must be on the same wave link. These are just the thing, nooks and crannies! Love your recipe. It's a keeper and on my to do list. The topping is great for a summer supper and looks devine. Last night I made sourdough EM ' Northwest Sourdough's recipe 'will be published later in her book' so it's not available anymore! Wanting to bake without turning on the oven, what perfect timing for EM's. I know what you mean about to many gadgets. I use a extra large biscuit cutter that has a soft rubber top. It comes in handy for lots of baking projects. Only requires one and doesn't take up to much space. You just roll the dough out about 1/2 inch thick, cut the muffins, cover them and let them rise...these took about an hour and half to rise. The cut will give you the sides that split nicely with a fork poke all the way around and then pull them apart. Only thing is I can't remember where I found it. It should be easy to locate one. Perfect size for EM's. Love the nooks and crannies! The recipe I made makes '30' I cut it in half..still to many for the two of us, unless you freeze some. Your recipe will be the next bake of EM for sure...Oh I found the biscuit cutter at of all places Michaels hobbies shop and it's a Wilton brand also comes in heart and flower etc. shapes. I just love it for cutting cakes, sandwiches and EM's, it has earned it's place. The EM dough is very, very sticky ... so just flour the board really good and the top of the batter/dough and it rolls out easily and cuts easy with the biscuit cutter. 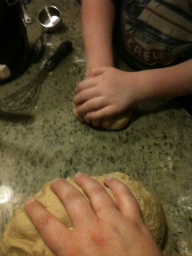 I'm used to rolling out dough with both hands since in the baker world you need to be quick. But I can see how rolling out dough and then cutting it, cookie-cutter fashion would work also. Let me know how it goes. For a square pan and a square griddle? No Mini, you're just thinking out of the box....er....circle. I may give that a whirl next time. 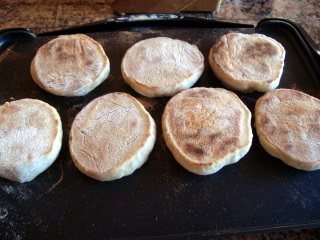 Beautiful looking english muffins larry. Thanks for posting the recipe, I'm going to make these on Saturday morning for eggs benedict... I'll let you know how they work out. A great way to start a Saturday. Let me know how they turn out. I might have to make those! I don't have an electic skillet, but do have an electric griddle - should do. I would think a griddle would do just fine. I made my first ones last Thursday. I, too, like them with just about anything from melted cheese under the broiler, to the old stand-by eggs benedict. I was surprised how easy they are to make. Your version looks wonderful, Wally. Having worked in the District through a goodly part of the 70's w/ the FTC, I know how sweltering it can be during the summer. Summer time in DC has a double whammy: humidity and an overabundance of tourists. Those English Muffins are just the thing to munch on as your crawling along on 95. Thanks for sharing and the memories, as well. or just about anywhere in the metro area. Thanks for the kind words Bernie. One of the nicest things about my last two jobs is that they started at 5am and 4am respectively in the District. I live out in Loudoun County, Va, and could make the drive in 30 minutes going in! And 45 coming back early afternoon! That was such a luxury. bring back sweet memories of childhoos. 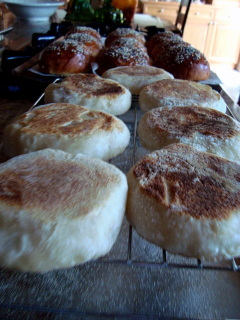 Of course those were only Thomas English muffins, and I have been wnting to make my own, especially with sourdough, for a long time. I do not have an electric skillet. Any suggestions on how I can get an accurate reading of the temperature of my gas burner? I make my Irish soda farls in an iron frying pan. Heat it long enough for the heat to even out on the pan and lower 'gas burner' to about medium usually does it and the farls are very similar in size color and thickness as an EM. Sue - I think experimentation is probably the only way - it's how we did them at the last restaurant I worked at. I think a temperature between medium and medium high is probably what you're looking for. One way to judge if it is hot enough is to watch the sides of the muffins. Within a minute or so bubbles should begin appearing (not unlike the bubbles you get with pancakes but bigger, and, in the case of the muffins they appear on the outer edges of the round, not on top. If you have the means to read it accurately, and accounting for the need to pre-heat to even out the griddle temperature??? Hi Andy - Well, thanks for confirming the temp setting I'm using on my electric skillet. At work we'd sacrifice the first muffin to see if the griddle was hot enough, too hot or still too cold. But you're absolutely right - our griddle had 3 different burners, so even if the temp was proper on one, it could (and frequently was) wrong on another. We could do 24 muffins at a time, and it generally took one bake to finally get things evened out. Never understood the differentiation between crumpets and muffins, so thanks, as usual for casting light on the shadows! As above; the led read is the little red square in the middle of the control panel. Unless you have something like the above, they are notoriously fickle beasts. The ones in my bakery kitchen in college range from furnace hot to too feeble to cook anything. I know just what you mean! I'll try them and let you know. That's about what I was thinking to do. Nooks, crannies and delicious, Larry! I just bleeped out all my photos and writting..here goes again. It does this when I put in my Alt Key + Number = Symbol for my degrees for temperature sign and release, it goes to my front page ;/...maybe someone can tell me why. I only made a couple tiny changes. I didn't use any yeast and replaced the water with 2% milk. 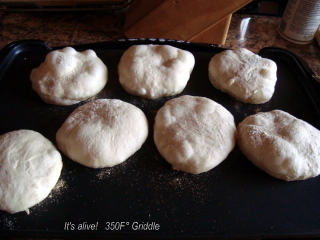 I baked on my electric griddle at 350F "no degrees sign" I pretty much doubled all the proof times. Everything worked well and the muffins are delicious. A pleasant flavor from my sweet very active levain with no sour taste. A lovely chew to the crust that you would expect from a good EM. A real keeper. Thank you, Larry! Opened my last homemade jar of applebutter for these babies. The cinnamon spicy apple butter was a perfect topping. I love EM's toasted but I couldn't wait....Ahhh but breakfast in the morning. Mike will love this toasted when he comes in from work tonight. This recipe will be doubled next round. Those look absolutely gorgeous Sylvia! Oh my, the very definition of nooks and crannies. I love the bubbles in the EMs in the skillet. I may have to give the milk substitute a shot. For a great recipe...now my favorite for EM's! I read that it has been suggested the milk makes for a little better keeping of the muffins...and you know I just baked up a hugh batch of another recipe : ) the same day you posted your EM's. Your's won't make it to the freezer. Thanks for the advice. Since I have no large iron skillet, my choices are: cook the EMs one by one in my small iron pan, use my large nonstick pan, or wait til I buy a large iron skillet. I have a large stainless skillet, but think that they would stick. I'm so eager to make them - wanted to today but won't have time. If I don't find a pan today, I may make them one by one tomorrow! make them with whatever cooking device you have available. But bear in mind that the cast iron pans are preferable because they hold stored heat. Lighter pans will just tend to burn your muffins when too hot, or, even worse, not cook them through when not hot enough. It's the long pre-heating of the cast iron that builds the heat to cook the soft dough through. Think wood-fired oven principles. My very first Englilsh Muffins! Success! I "cooked" these in a coated aluminum (I think) pan, over a gas burner. My husband gobbled the first one; said it was "Good!" (his best praise). I am new at inserting pictures; I think I cqn only insert one. I'll send the shot of the crumb in the next comment. The first batch, I think, had a lilttle too gummy a crumb, but nothing a pop into the toaster won't fix. You may have to tweak the griddle heat up just a notch, or alternatively, give them maybe a minute more on each side if they seem undercooked, but they sure look good to me. Post up a crumb shot when you can. Here's the crumb: As I said, a little gummy, but my husband likes it that way. I am exercising self control and will taste it in the morning, toasted. correct EM crumb picture, finally! Sorry for the picture-posting mistakes. I'll get the hang of it. Larry, thanks for the kind comments. I was wondering why you added the extra yeast? I'm glad you've found a winner. I think the hydration is just at the point where you can still work the dough fairly easily, but there's enough water to allow the nice open crumb with its nooks and crannies. I have the same question Sylvia posed: why the higher amount of yeast? and, did that affect its fermentation/proofing time? I added the extra yeast because I didn't give the starter an overnight proof, I did 3 hours. I wanted to make sure those muffins would have pleanty of gas for those nooks and crannies. Everyone should try your recipe it is fun, tastes great and you will be proud to serve them. Ok, so the starter was mainly for flavor. Thanks Debbe1, just wanted to get my arms around the extra yeast. Thanks for the accolades! How do you produce the Levain? This sounds like a great recipe. I am wondering about the levain. How much instant yeast is used in the mixture for the levain? What are the ingredient percentages in order to double, tripple, or even quadrupple the recipe? No yeast is used in the levain build; it's composed of equal weights flour, water and levain (I keep my levain @ 100% hydration. Here is the formula with the original quantity which produces 8 x 3oz (85g) English muffins. You'll notice I've modified it at the suggestion of SylviaH and added milk which I scald to get rid of any enzyme problems. Good luck - they continue to keep me and my friends happy. Thank you for your response. Great explaination. However, I must be confused about levain. Do you make levain or do you purchase it? Hi Joe - I use a levain I created about 2 years old and is now quite strong and lively.